The HC-0803, interposing device, interfaces between control panels and door locks, lighting circuits, HVAC, etc. A red status LED is provided for each relay. Relays are UL recognized. The HC-0695 and HC-0724, interposing devices, interface between control panels and door locks, lighting circuits, HVAC, etc. The HC-0801, interposing devices, interfaces between control panels and low amperage field devices. A green diagnostic status LED is provided for each relay. Relay coils and contact points are available on both screw terminals and ribbon connectors. The HC-0604 interfaces between control panels and low amperage controlled field devices A RED diagnostic / status LED is provided for each relay. The HC-0701 communicates with an HC-0682 System Controller, or a Personal Computer, via a single twisted pair shielded RS-485 data cable. Multiple HC-0701 modules may be used on control panels with greater than 128 I/O. Note: LED supervision boards, HC-0804 and HC-0806. The HC-701 cannot be used in combination with the Remote Panel Controller. The HC-0731 converts sixteen 22 to 12 AWG field device conductors to 26 AWG ribbon cable and provides circuit pads for LEDs, resistors, diodes and power capacitors to modify or customize the sixteen circuits. The HC-0639 converts fifty 22 to 14 AWG field device conductors to 26 AWG ribbon cable. The HC-0476 converts fifty 22 to 14 AWG field device conductors to 25 pair telephone type cable. The HC-0675 converts ten 22 to 14 AWG field device conductors to 26 AWG ribbon cable. The HC-0673 converts fifty 22 to 14 AWG field device conductors to 26 AWG ribbon cable and provides either in-line resistors or diodes. 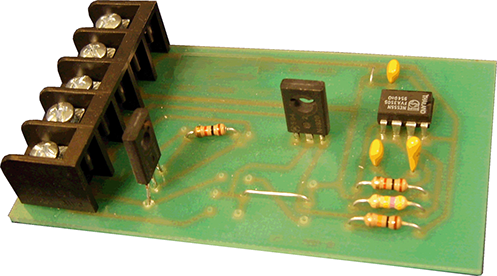 The HC-0815A adds an inline diode to forty-eight circuits. The HC-0815B adds an inline diode to forty-eight circuits with a common anode connection prior to each. The HC-0815C adds an inline driver to forty-eight circuits. The HC-0815D adds an inline 680 ohm resister to forty-eight circuits. The HC-0815E adds an inline 120 ohm resistor to forty-eight circuits. The HC-0815F adds a common cathode connection to forty-eight circuits. The HC-0815G adds an inline diode to forty-eight circuits with a common cathode connection after each. The HC-0642 provides a half second flash rate output. LED Supervision Motherboard and sisterboard. 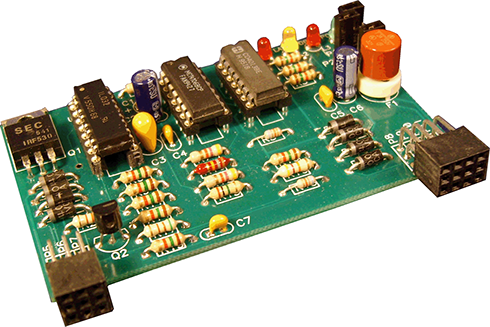 The HC-0804 AA functions in conjunction with the HC-0806 LED Supervision Daughterboard. Forty-eight status display inputs are adapted for supervision of, and output to, the LEDs. Up to four HC-0804AB sisterboards share an HC-0806. The HC-0806 supervises up to 240 LEDs for short or open condition. Failures are detected an in either the LED's on or off state. The supervision circuit automatically resets when a failure is corrected or no longer detected.. Short (red), Latch (yellow), Open (red) and Power (green) status LEDs are provided. The Latch yellow LED captures an intermittent failure detection and must be reset by a technician. on-off switch. A red LED indicates when the circuit is low. A switch is provided to ground the circuit.